An extremely faithful pair of ports. 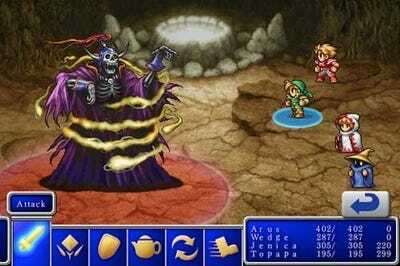 The original FF1 and FF2 are old enough that Square Enix decided to revamp the artwork for the iPhone, making these versions noticeably prettier than the originals. Gameplay doesn't suffer too much on account of the touch controls because of the games' slowish pace, and honestly, even if it did, these games are basically a lock for Final Fantasy fans anyway. My only reservation is that the games costs $9 each. $9 for both would've been more like it. 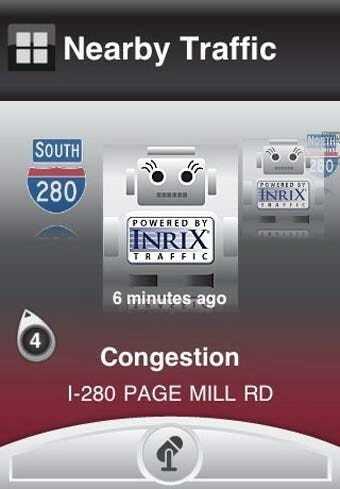 Last time we saw this app, it was a mere traffic reporter. It had big buttons, and it aggregated voice messages from other users, but still: traffic. Now Aha's expanded its big-buttoned philosophy -- that philosophy being, I think, that if you have to fiddle with your phone while you're driving (you don't!) 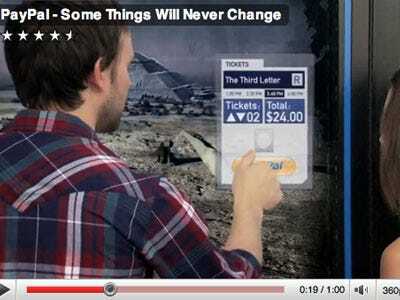 then it may as well be as easy as possible -- to Facebook, Twitter, local points of interest and streaming podcasts. And its voice reports system has been expanded into a full-on set of community radio stations, populated by the voices of other Aha users, who will yell about whatever they while driving, I guess? Anyway, free. This one falls into that vexing category of dead-simple, dead-hard, dead-brilliant iPhone puzzle games. Extract what little comfort you can from the game's soothing aesthetic, because until you really get a feel for the gameplay concept, it's going to be a rough ride. As far as how it works, I'll leave the explaining up to the video. $2, though a lite version is available. Hey, guess what's not fun! A discussion about a scientific issue in which both parties have access to the same data, yet still disagree, angrily and forever! 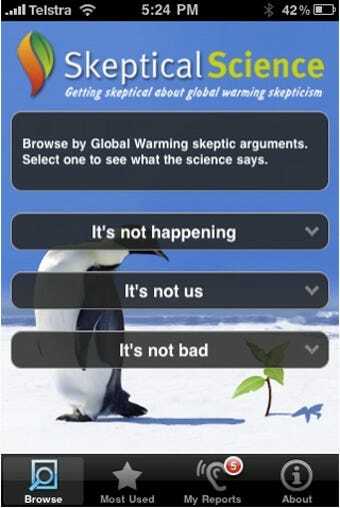 If you're frustrated by deniers, sceptical Science offers a handy guide for debunking common claims about climate science. You're still probably not going to change anyone's mind, but at least you'll feel good about proving someone else wrong on some granular point, and that's what debate is about, right? Right. Wilson, Gizmodo's resident closeted band-haver, calls this a 'classy value-added way to advertise products,' but says it's 'chump' compared to GTK, lacking varied metronome sounds and multiple guitar types, and possessed of a much less navigable chord guide, and no way to hear how a given chord sounds. A feature-to-feature comparison like this could go on forever, but that's not the point. 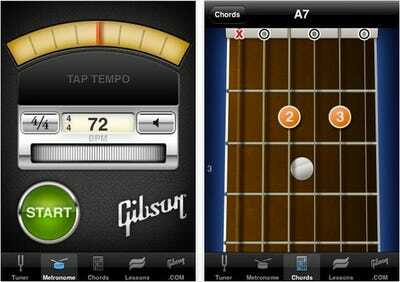 The point is the Gibson's app is free. 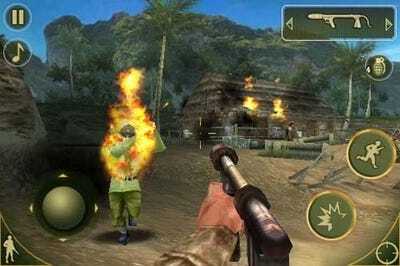 The first Brothers in Arms game had problems ranging from blocky graphics to awkward controls, which weren't bad enough to ruin the game, but just bad enough to prevent it from being great. Brothers in Arms 2 upgrades the graphics considerably, improves the controls marginally, and opens up gameplay options immensely. If you enjoyed the first one, you'll love this one. If you've never dabbled in a 3D shooter on the iPhone for fear of utter terribleness, this is a good place to start. $8. Terribly violent little casual game, to birds. A terrible addictive little casual game, to humans. 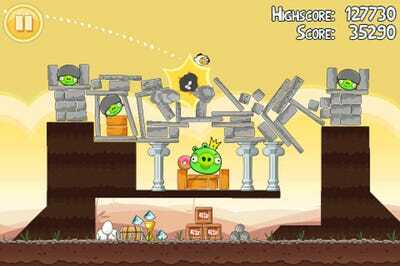 It's a bit like a cross between a scorched earth game and a physics tool--your goal is to launch an avian cartoon into precariously stacked structures. The more you knock down, the higher you score. If you're not ready to throw down a dollar based on the concept alone, there's a pretty solid lite version, too. Prancing awkward back and forth across the line that separates advertising from, you know, stuff you might voluntarily subject yourself to, the Vogue app is a sort of pocket wardrobe catalogue, compiling both pre-listed items and stuff you've added yourself into a toy for fiddling with outfits, which is something I can speak about with little to no authority. I will say this, though: It's pretty. 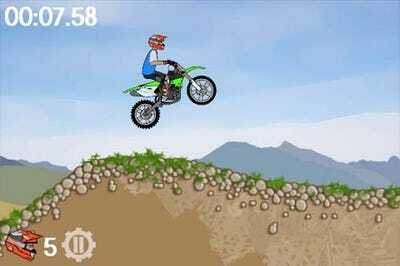 Who knows why, but good trials games are hard to come by on the iPhone. This is a good trials games, albeit of a very specific type. Think Teagames-style, don't-fall-over-but-don't-go-too-slow type of stuff, not the crawling, puzzle-like trials you find in games like Trials HD. Tons of playability for $1. 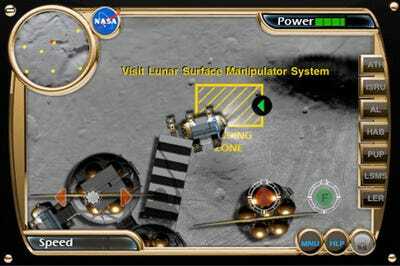 Lets you simulate the various tasks and challenges involved in supporting a functioning lunar outpost. In any case, go to the App Store and enjoy the free game, because the real thing is not going to happen.